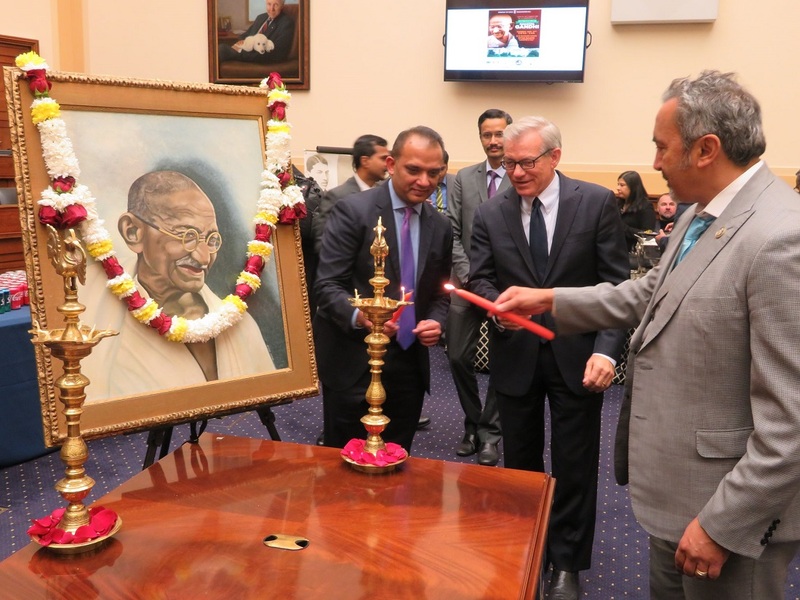 Rep. Ami Bera, D-CA, (right) lights the ‘diya’ (ceremonial lamp) at the launch event on Capitol Hill for the year-long celebrations of the 150th birth anniversary of Mahatma Gandhi. Seen in the center is Republican lawmaker David Schweikert of Arizona. Indian Embassy partners with community and business organizations to kick-start commemoration period. WASHINGTON, DC: Year-long celebrations for the 150th birth anniversary of Mahatma Gandhi commenced on Capitol Hill with US lawmakers, senior Indian diplomats, community activists, press and media persons, gathering in the Rayburn House Office Building for a formal and dignified event befitting the father of the Indian nation. Reflecting on Gandhi’s legacy, Sarna said, it is “a time to remember, a time to reinforce, a time to apply those teachings and those messages to our life.”The US capital city, he noted, is well acquainted with India’s independence leader through the Gandhi Memorial Center, and his statue situated on public land across from the Indian Embassy which was approved by the US Congress. Tuesday evening on Capitol Hill, Krishnamoorthi declared, “There is absolutely no way that I could be standing before you in the absence of Mahatma Gandhi.”Referring to the “profound influence” that Gandhi had on King and the civil rights movement in the United States, the lawmaker affirmed, “Without that civil rights movement, without the breaking down of the racial barriers that held so many people back in this country, there is no way that people who look different from some of the previous occupants of my office could have come to the fore, and that includes me.” It is an “incredible bounty that we have all enjoyed and that I have personally benefited from,” he added. The Illinois Democrat affirmed, “Our perspectives, our horizons have widened because of this man. It is up to us to step up and take advantage of those opportunities and get even more involved,” in civic life, he said. Noting that Indian Americans voted across the country in this year’s midterm elections, Krishnamoorthi implored members of the community to do more: to run for office, but with a caveat – not to run for Congress from Illinois’s 8th congressional district which he represents. Congressman Ami Bera of California who has the distinction of being the longest-serving Indian American member of Congress believed it is important to reflect on the lessons that Gandhi taught in today’s somewhat “chaotic times and often chaotic politics — his lessons of putting service and humanity first, and addressing injustices with strength. It is not passive resistance,” he said noting “it takes a lot of courage to do what he did. Gandhiji showed us what that path forward is,” said the lawmaker who has served as the Democratic co-chair of the House India Caucus. Referring to a news headline, Gandhi goes global, Kansara said, “It is hard to think how much more global or universal Gandhi’s message can be.” He extolled the Indian Embassy for raising the bar by gathering musicians and performers from across the world to perform Gandhiji’s favorite bhajan, Vaishnava Jana To, written by Gujarati poet Narsinh Mehta in the 15th century. The audience was treated to the fusion video by artistes from over 120 nations.